A Regal portable restroom experience. Common phrases used to find our portable restrooms include: “potable toilet“, “porta potty“, “portable restroom trailers“, “portable restroom rental“, “portable restrooms for rent“, “luxury portable toilet rentals“, “porta potty rental” or “portable bathroom rentals near me“, Royal Restrooms of AZ can help! We offer porta potty rentals the entire Phoenix Valley of Arizona, including: Phoenix, Scottsdale, Cave Creek, Peoria, Glendale, Mesa, Gilbert, Chandler, Sun Lakes and more. Get a free estimate by giving us a call or using our contact form. If you are planning an outdoor wedding, having enough restroom facilities for your guests can be a challenge. Renting portable restrooms can solve that problem! 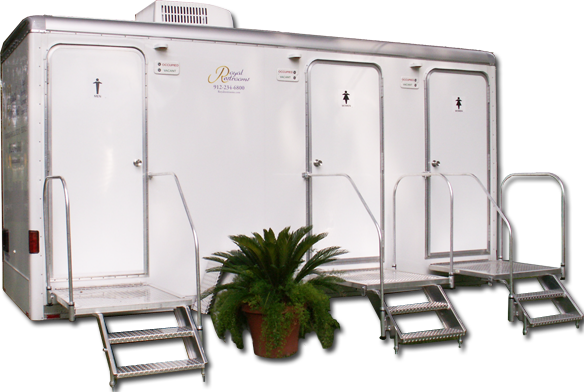 Royal Restrooms of AZ provide affordable portable restrooms for weddings. Create an unforgettable even with luxury portable toilets. Comfortable and upscale, our portable restrooms for special events have many options and amenities including lighting, hardwood floors, background music, hot water and more. Residential and commercial construction sites need clean portable restrooms in order to reduce labor costs and save time. From standard porta potties to luxury portable toilet rentals for construction or remodels, we can handle it all. Our portable shower trailers for rent were designed with plenty of space in mind. 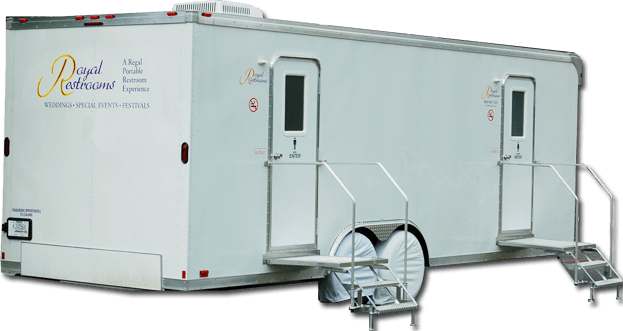 With Royal Restrooms of AZ, our mobile shower trailers are compact enough to be placed in many different areas and can fit in even the most challenging of spaces. 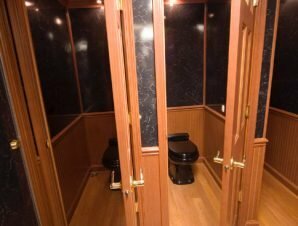 Luxury portable restrooms, also known as, fancy porta potty, elegant porta potty, or high end porta potties are great for weddings, corporate parties, private parties and other types of formal occasions. 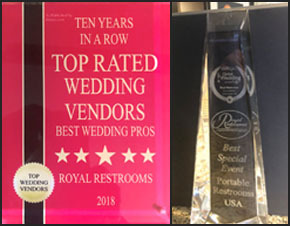 Royal Restrooms Of AZ has received the award for Top Rated Wedding Vendors Best Wedding Pros for 2018 and the past 10 years in a row by Brides.Com! We also won the award for Best Special Event Portable Restrooms in the USA by LUXlife Magazine. Their wedding awards showcase the best vendors from across the wedding industry. The professional and reliable staff of Royal Restrooms of AZ are committed to exceptional service while accommodating your next outdoor event with the highest quality luxury portable restrooms and shower trailers. From intimate outdoor weddings, reunions and parties to large music festivals and national events, Royal Restrooms of AZ has the optimal portable restrooms to enrich your event by providing comfort and convenience to your guests. We recognize the need for an upscale alternative option to traditional portable restroom and shower rental services. We take pride in providing the highest quality portable personal facilities for large outdoor events, sporting matches, and construction remodels. Since our inception six years ago, Royal Restrooms AZ has grown to become the largest independent supplier of short and long-term outdoor rental restroom and shower trailers in the southwest. 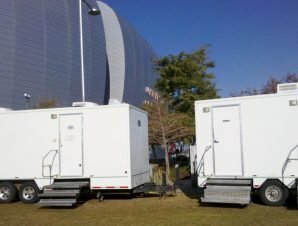 Whether you are coordinating a long term event, such as a film or music production, home/office remodel, or hosting an event, Royal Restrooms of AZ can mobilize to serve your mobile restroom needs. We carry a large variety of private bathroom and shower trailers in inventory at all times. We can move quickly to reach any location or event – large or small. If you are planning a garden party or wedding, a family reunion, hosting a local festival, or coordinating a large corporate function, Royal Restrooms of AZ will accommodate your event in style. We are all concerned with sanitation when using portable facilities. Royal Restrooms is dedicated to providing the most sanitary and the most comfortable restroom environments available, while maintaining convenience and affordability in restroom rental services. Call today: 480-734-9809! Our guests were completely overwhelmed by the quality of the restrooms supplied by Royal Restrooms and I was so very impressed by the service, professionalism and flexibility displayed by the owner, John Fuller. Every detail was covered, the pricing was extremely competitive and the units were immaculate. Frankly, I could not be more pleased and will be using Royal Restrooms again and again. Our event is completely first-class and it was important that the restrooms lived up to the standard set at the event. It's not often you hear guests discussing 'port-a-potties' but these units were so nice they had our guests singing their praises. We look forward to working with Royal Restrooms again in the future! Royal Restrooms was the perfect choice for our wedding. They were easy to get in touch with and very pleasant to work with. Our wedding guests were impressed by how clean, comfortable, and nice smelling these restrooms were. Everything we needed was included with the restrooms (towels, tp, soap, etc). Would highly recommend and use again for another event! Royal Restrooms of AZ is who we turn to when we need waste services in their area. My Company Arwood Waste has worked with them for years and we always enjoying with their entire team! Thanks for providing the restrooms for guests of our corporate NYE party. The restrooms were very nice, clean and they provided plenty of paper products. We will definitely use Royal Restrooms again! Nancy - Falcon Executive Aviation - Mesa. We used Royal Restrooms for my daughter’s wedding last weekend. 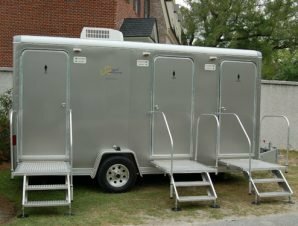 These portable restrooms on a trailer were very clean, classy and well-lit, well stocked and a great addition to our event. I recommend this company to all. The personnel are friendly, competent and very helpful too. RENT A LUXURY PORTABLE TOILET & SHOWER TRAILER FOR THESE EVENTS! Royal Restrooms is a leader in Luxury Portable Restrooms, Bathrooms, Toilets & Showers, Portable Executive & VIP Event Mobile Restrooms. © Copyright 2010-2018 Royal Restrooms Arizona. All Rights Reserved.